Department of Radiation Oncology, Washington University School of Medicine, Campus Box 8224, 4921 Parkview Place St. Louis, Missouri 63110, USA. The recent clinical use of a ViewRay radiation therapy system (ViewRay, Cleveland, OH, USA) represents a significant advance in cancer care, enabling clinicians for the first time to deliver highly conformal intensity modulated radiation therapy (IMRT) with real-time magnetic resonance imaging (MRI) guidance. However, the rapid advances in the technology to deliver such radiation treatments have not been paralleled by corresponding advances in the ability to verify these treatments. Recently, Li et al. presented the dosimetry results for the first 34 patients receiving IMRT using ViewRay. In their work, absolute dose was verified at a central point using an ionization chamber dosimeter, and the relative distribution was verified in selected planes utilizing radiographic film measurement and in quasi-three-dimensional (3D) utilizing cylindrical diode array (ArcCHECK, Sun Nuclear, Melbourne, FL, USA) measurement. However, quantitative radiographic film measurement is labor intensive while large energy and angular dependencies of an ArcCHECK device raise significant dosimetry concerns. Above all, these measurements present at best a partial sampling of the 3D dose distribution. Therefore, it is of great interest to investigate real 3D water-equivalent dosimeters, for example, polymer gel dosimeters  in ViewRay's IMRT dosimetry. Water-equivalent polymer gels, for example, a polyacrylamide gel dosimeter functions using radiation-induced polymerization of monomers. The R2 (R2 = 1/T2, T2 the transversal relaxation time in MRI) of the gel is proportional to the amount of polymerization at a point in the gel, which is in turn proportional to the absorbed dose at that point. 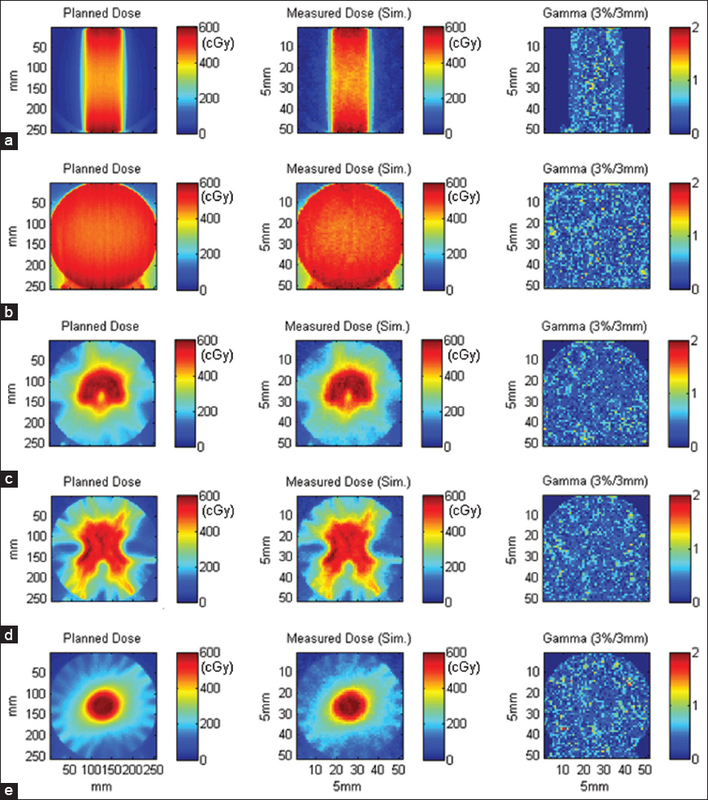 Imaging the R2 relaxation rate distribution in the polymer gel using an MRI scanner produces a 3D dose distribution map. Despite a thriving literature on the applications of the 3D polymer gel dosimeter in radiation therapy dosimetry, at present, the technique remains largely peripheral to routine clinical practice, partially due to the accessibility problem to a MRI scanner. However, this will not be an issue for a ViewRay clinic as the onboard 0.35 T MRI scanner will always be available to a physicist who typically performs dosimetry work after hours. We envision that a physicist can deliver a ViewRay IMRT plan to a polymer gel dosimeter and then image the dosimeter in situ using the onboard MRI scanner: A T1-weighted imaging to determine the phantom's geometry for the subsequent dose calculation by the treatment planning system (TPS), and a T2-measurement imaging to determine the delivered 3D dose. A dose comparison using gamma analysis can then be made between the measured and calculated dose distributions as the latter can be obtained within a minute using ViewRay's onboard Monte-Carlo engine after plan delivery. At present, T2-measurement sequence is not open to the authors on a ViewRay system. Therefore, in this communication, numerical simulations have been performed to investigate the feasibility of using polymer gel dosimetry at 0.35 T. The goal is to answer one question: What are the gamma passing rates using 3% dose error and 3 mm distance-to-agreement (DTA) based on the AAPM TG 119 recommendations? The total irradiation and MRI scanning time per IMRT plan dosimetry was designed to be approximately 1-h or less, which is generally acceptable in routine clinical practice. Using a voxel size of 5 mm × 5 mm × 5 mm was for two reasons: (a) To match the ionization chamber volume of 0.123 cc used in Li's work, and (b) to match the detector resolution of a widely used two-dimensional ionization chamber array, MatriXX (IBA Dosimetry, Schwarzenbruck, Germany), which is 4.5 mm in diameter and 5 mm in height. Two percentage dose error and 2 mm DTA gamma criteria were also studied, which was motivated by a recent publication by Nelms et al. in that IMRT errors could be more sensitive to tighter tolerances. A spherical BANG ® (MGS Research, Inc., Madison, CT, USA) polymer gel dosimeter, 16.6 cm in diameter, was used in this work. The gel was imaged using 120-kVp X-ray, slice thickness of 1.5 mm, and field-of-view (FOV) of 70 cm using a Philips Brilliance 64-slice computed tomography scanner (Philips Medical Systems, Cleveland, OH, USA). Three fiducial markers were placed on the central transverse plane of the spherical container. The irradiation was performed using a 6 MV beam from a Varian medical linear accelerator: 6 cm × 6 cm field size, 600 MU, and 100 cm source-to-axis distance. 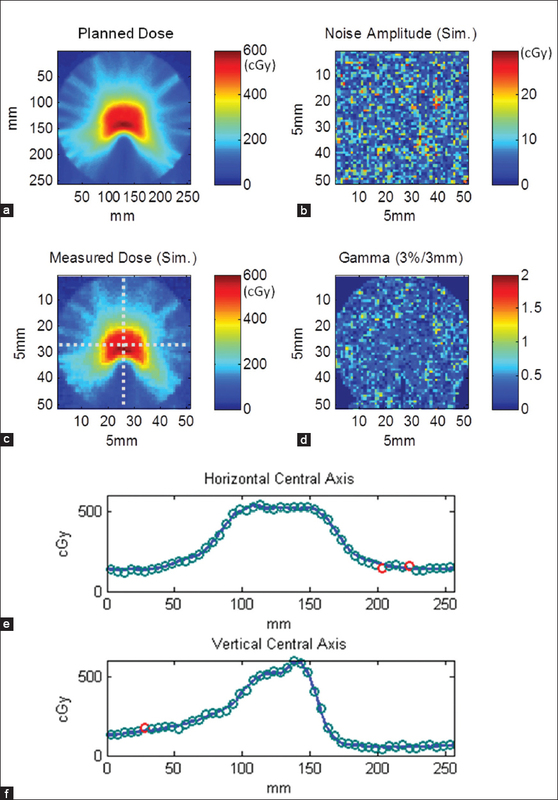 The dose distribution under this irradiation geometry was calculated using a Pinnacle TPS. where B0 is the magnetic field strength, V is the voxel size, Nx and Ny are the numbers of frequency and phase encoding steps, respectively, NSA is the number of signal average, and σ is the standard deviation of the MR signal in background air. where TE2 = 100 ms, S (TE2) = signal strength for TE2 image, TE1 = 20 ms, and S (TE1) = signal strength for TE1 image. The Pinnacle TPS dose image of the simple 6 cm × 6 cm open field and the acquired R2 image at 1.5 T were registered using a landmark registration method. Once registered, each pixel in the TPS dose image had a corresponding pixel in the R2 image; thereby a dose versus R2 calibration curve was generated. The calibration curve was then applied to the measured R2 values to convert them to doses. This method is similar to a plan-based calibration method proposed by Olch et al. for dose calibration of 2D radiation detectors. The differences between the 1.5 T gel-measured and Pinnacle TPS calculated doses were defined as noise, from which the noise power spectrum was calculated. The noise for gel dosimetry at 0.35 T would be equivalent to that at 1.5 T as long as they have equivalent SNRs [cf. [Table 1]. The estimated noise was then added to a set of ViewRay TG-119 benchmarking plans to simulate the gel measured dose- distributions as if a 0.35 T scanner were used. Gamma analysis was conducted to compare the gel measured dose at 0.35 T and the TPS calculated dose using the following criteria: Absolute dose comparison, 3% or 2% dose difference threshold, Van Dyk percentage difference (i.e., the percentage difference in dose was with respect to the maximum point in the region), 3 mm or 2 mm DTA threshold, and 10% lower dose threshold. The effects of nominal target dose level and MR scanning time on gamma passing rate were investigated. [Table 1] lists the scanning parameters for MRI at 1.5 T and the simulated scanning protocols at 0.35 T, and their SNRs. A 0.35 T MRI scanning with a voxel size of 5 mm × 5 mm × 5 mm, FOV of 320 mm × 320 mm × 300 mm, TR of 6600 ms, NSA of 5, and scanning time of 35.2 min would yield a comparable SNR as a 1.5 T MRI scanning with a voxel size of 2 mm × 2 mm × 3 mm. [Figure 1]a shows a ViewRay TG-119 prostate plan with a target dose of 6-Gy calculated in ArcCHECK geometry. [Figure 1]b shows the amplitude map of the simulated noise at 0.35 T with a voxel size of 5 mm × 5 mm × 5 mm and a scanning time of 35.2 min. [Figure 1]c shows gel-measured dose distribution at 0.35 T by adding the simulated noise to the planned dose. [Figure 1]d shows the 3%/3 mm gamma map at the isocenter slice. The gamma passing rate in the 3D volume was calculated to be 98.3%. [Figure 1]e and f shows the horizontal and vertical profiles of the planned dose (solid) and gel-measured dose at 0.35 T (circles) along the two dash lines in [Figure 1]c, respectively. Good agreement was observed for both profiles with a few failing points shown in red. [Figure 2] shows the planned dose, gel-measured dose at 0.35 T and gamma map for the other five TG-119 plans with a 6-Gy target dose. The mean passing rate and standard deviation using 3%/3 mm gamma criteria were 98.1% ± 0.6%. The gamma passing rate and standard deviation using 2%/2 mm criteria were 88.1% ± 1.8%. At 2-Gy level, the six plans had a mean 3%/3 mm gamma passing rate of 65.2% ± 4.3%; at the 4-Gy level, it increased to 91.1% ± 2.1%. For 3%/3 mm, a scanning time of 35 min appeared to be optimal since there was only a minimal increase in gamma passing rate when increasing the scanning time to 178 min, 98.1% ± 0.6% versus 99.5% ± 0.2%. For 2%/2 mm, a 35-min scanning would achieve a passing rate of 88.1% ± 1.8%. A longer scanning time, for example, 178 min, would achieve a passing rate of 94.0% ± 1.1%. 300 mm, scanning time of 35.2 min, and target dose level of 6-Gy. An isotropic 5 mm dose data would at least match the resolution of a MatriXX ionization chamber array but in 3D. Lower target dose level would result in lower gamma passing rates while longer MR scanning time would achieve higher gamma passing rates. With a 178-min scan, the 3%/3 mm gamma passing rate increased to 99.5%, and the 2%/2 mm gamma passing rate increased to 94%. Therefore, a decision has to be made between target dose level, MR scanning time, and gamma criteria in designing a dosimetry protocol. There are pros and cons to each dosimetry system that is available to a physicist. A water-equivalent, MRI compatible 3D polymer gel system would certainly provide a unique, complementary, and versatile tool. Another motivation for this work is due to the existence of another well-studied polymer gel dosimeter, MAGIC. As opposed to BANG-gel dosimeter that must be produced and handled under oxygen-free conditions, MAGIC-gel dosimeter can be manufactured under the normal atmosphere and can, therefore, be produced in a wet lab located in a Radiation Oncology clinic. Several groups demonstrate that setting up a 3D dosimetry program in a clinical department using in-house or inexpensive MAGIC-gel dosimeters is feasible., T1 based Fricke gel is also worth testing as now the user has full access to a MRI scanner so diffusion may not be a problem. This pilot work has several limitations. First, SNR is determined by many factors such as field strength, radiofrequency coil, gradient, etc., Therefore, Eq. 1 is a rather ideal description of the SNR. In this study, a transmit and receive head coil was used on the 1.5 T MRI scanner while ViewRay's 0.35 T MRI scanner uses a phased array coil to achieve better SNR. In addition, ViewRay's gradient system has lower maximum gradient strength and maximum slew rate, which could affect the R2 measurement or SNR. Second, this work did not include systematic deviations in measured R2 as a result of magnetic field nonuniformity (B0) and B1-field nonuniformity. Third, recent work , has demonstrated that the ViewRay planned dose can be accurately delivered based on well-established dose measurements; however, the slight difference or imperfection would add additional noise, which was not accounted in this work. Finally, the limitation of gamma passing rate as a measure of treatment quality in patient geometry has been discussed in a number of papers., Therefore, more clinically impactful quality assurance (QA) metrics, for instance, dose-volume-histogram values in the patient geometry for pretreatment QA should be used to determine how well a dosimeter performs as to evaluate treatment quality. The simulation results suggest that 3D polymer gel dosimetry using a low-field onboard MRI scanner could be a useful dosimetry method. Due to simulation work's limitations, the gamma passing rate results presented here could represent the best scenario. Future experimental work that involves collaborations between MRI-RT manufactures, polymer gel dosimeter vendors, and medical physicists could be warranted to support the hypothesis that a reinvigoration of research and development efforts in polymer gel dosimeter is likely due to the advent of MRI-guided radiation therapy. Li HH, Rodriguez VL, Green OL, Hu Y, Kashani R, Wooten HO, et al. Patient-specific quality assurance for the delivery of (60) Co intensity modulated radiation therapy subject to a 0.35-T lateral magnetic field. Int J Radiat Oncol Biol Phys 2015;91:65-72. Baldock C, De Deene Y, Doran S, Ibbott G, Jirasek A, Lepage M, et al. Polymer gel dosimetry. Phys Med Biol 2010;55:R1-63. Nelms BE, Chan MF, Jarry G, Lemire M, Lowden J, Hampton C, et al. Evaluating IMRT and VMAT dose accuracy: Practical examples of failure to detect systematic errors when applying a commonly used metric and action levels. Med Phys 2013;40:111722. Olch AJ, Whitaker ML. Validation of a treatment plan-based calibration method for 2D detectors used for treatment delivery quality assurance. Med Phys 2010;37:4485-94. Gustavsson H, Karlsson A, Bäck SA, Olsson LE, Haraldsson P, Engström P, et al. MAGIC-type polymer gel for three-dimensional dosimetry: Intensity-modulated radiation therapy verification. Med Phys 2003;30:1264-71. Crescenti RA, Scheib SG, Schneider U, Gianolini S. Introducing gel dosimetry in a clinical environment: Customization of polymer gel composition and magnetic resonance imaging parameters used for 3D dose verifications in radiosurgery and intensity modulated radiotherapy. Med Phys 2007;34:1286-97. Wooten HO, Rodriguez V, Green O, Kashani R, Santanam L, Tanderup K, et al. Benchmark IMRT evaluation of a Co-60 MRI-guided radiation therapy system. Radiother Oncol 2015;114:402-5. Nelms BE, Zhen H, Tomé WA. Per-beam, planar IMRT QA passing rates do not predict clinically relevant patient dose errors. Med Phys 2011;38:1037-44. Zhen H, Nelms BE, Tome WA. Moving from gamma passing rates to patient DVH-based QA metrics in pretreatment dose QA. Med Phys 2011;38:5477-89.